The Optoelectronics group of Vishay Intertechnology, Inc. (NYSE: VSH) this month introduced a new high-accuracy digital ambient light sensor for flat-panel televisions and consumer handheld devices. 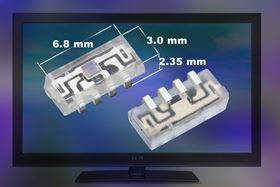 The Vishay Semiconductors VEML7700 combines a photo-diode, low-noise amplifier, and 16-bit ADC in a miniature, transparent surface-mount package measuring 6.8 mm by 3.0 mm by 2.35 mm. The sensor adopts Filtron™ technology and supports an I²C bus interface for simple operation. The device is used for backlight dimming and optical switching for consumer products, in addition to power on / off for industrial lighting systems. With its compact size and mounting flexibility as a side- or top-view device, the sensor allows designers to save space in compact televisions, CCTV cameras, smartphones, PDAs, and GPS units, while providing flexibility in where and how they place the device. When used in conjunction with Vishay IR receivers such as the TSOP772, the VEML7700's side-view package offering the same dimensions and optical axis height greatly simplifies window designs. Filtron technology enables ambient light spectral sensitivity close to that of the human eye, while the sensor's adoption of O-Trim™ technology provides an output tolerance of ≤ 10 %. The device offers detection from 0 lx to 167 klx and resolution down to 0.005 lx/ct, allowing for operation in applications with low-transmittance (dark) lens designs. The VEML7700 provides 100 Hz and 120 Hz flicker noise rejection and excellent temperature compensation from -25 °C to +85 °C. The device offers low power consumption down to just 2 μA in operating mode and 0.5 μA in shutdown mode. The VEML7700's supply voltage range is from 2.5 V to 3.6 V, while its I²C bus voltage range is from 1.7 V to 3.6 V. Offered in a lead (Pb)-free, 4-pin molded package, the device is RoHS-compliant, halogen-free, and Vishay Green. This story is reprinted from material from Vishay Intertechnology, with editorial changes made by Materials Today. The views expressed in this article do not necessarily represent those of Elsevier.